In addition to setting an overall record enrollment, 27.8 percent of the university's undergraduate student body is Hispanic. With a record enrollment of Hispanic undergraduate students during fall 2017, Texas Tech University has met the enrollment criteria to be recognized as a Hispanic-Serving Institution (HSI) by the U.S. Department of Education. This fall marks the first time the undergraduate student body has surpassed 30,000 students, with 30,759 undergraduates enrolled, 27.8 percent of which are Hispanic. Total enrollment for the university is 37,010, also a record. In addition to other requirements, an institution designated as an HSI shows at least 25 percent of its full-time undergraduate students are Hispanic. With 2017 as the qualifying year for Texas Tech, the university is on track to that official designation beginning in 2019, resulting in access to new federal funding of more than $8 to 10 million that may be available after the application period that year. "This is an important distinction for Texas Tech University," said President Lawrence Schovanec. "We will be one of 10 Carnegie Tier One institutions to receive this designation, which will greatly benefit our continuing efforts in educating and graduating a diverse student population. Eventually, it will result in increased federal funding and offer other opportunities for funding channels previously unavailable." Elizabeth Sharp, interim vice president of the Division of Diversity, Equity & Inclusion, said steps have been taken campus-wide to help the university achieve HSI status. "An HSI committee has been formed to guide our efforts in identifying ways we can make Texas Tech University more responsive to the needs of Hispanic students and to identify new funding opportunities that will be available to Texas Tech," Sharp said. "We are creating a Texas Tech website that explains the benefits of HSI status of one of the committee's initial responsibilities." In addition to meeting the HSI enrollment criteria for the entire student body, Hispanic enrollment this semester accounts for 38.8 percent of first-time freshman students. "We know that the number of Hispanics in the state demography has been increasing," said Ethan Logan, associate vice president for Enrollment Management. "For us to match that in terms of an increase in enrollment means we're running parallel to the state demography, and as a public institution of higher education, we should mirror that to the best of our ability." Logan said in addition to a changing state demography, there are other factors contributing to an increase in Hispanic students at Texas Tech. One is the recruitment of students in groups that have been historically underrepresented on college campuses. "We have been proactive in expanding our undergraduate outreach to as many students as possible, including underrepresented minorities, first-generation college students and students from depressed or low-socioeconomic backgrounds," Logan said. "As the high school population of potential college freshmen becomes more Hispanic, that obviously translates into recruiters connecting with more students within that ethnicity." Another factor in the changing student body is a shift in the way second- and third-generation students view higher education, particularly in regards to how far they will travel from home to attend an institution. Nationally, most students attend a university within 100 miles of their home. Logan said at Texas Tech, most students travel much further than that, but research shows Hispanic students are more hesitant than the average student to head to a college or university located far from their families. "I appreciate that from a cultural perspective, but I also think this may be a first-generation idea of college, and as we start to get into the next generation, that's starting to transition," Logan said. "Additionally, while we have a significant population of people of Hispanic origin in this area, West Texas is slow in the growth of the total population of people in comparison to the metropolitan communities in the I-35 corridor. "It means that the Hispanic students we are seeing at Texas Tech are a little more mobile and not as hesitant to move across the state to receive an education. The brand and the promise of a higher education experience at Texas Tech University is appealing to people from farther out in our state, and they are more willing to accept the challenge of moving from their home base to participate in higher education." Reaching HSI enrollment status means Texas Tech continues to make strides in diversifying the university, an important investment when it comes to higher education, Logan said. Diversification brings together different cultures, views, experiences and ideas to students from all backgrounds. "The element of diversity is not limited to ethnicity," Logan said. "In comingling different types of diversities, we enhance the opportunities to develop new knowledge and research, and we also give people a broader understanding of the world. 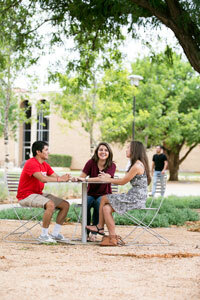 I hope we continue to consistently appeal to more and more students who want to attend Texas Tech." This year, Texas Tech also yielded a record 16 National Merit Scholars, and a record-breaking number of Presidential Scholarships, more than doubling last year's total. "The success of students in all areas of study is evidence that our university is committed to creating innovative learners who will go on to impact their communities in Lubbock, across the state and beyond," Schovanec said.